Richard Sherman is not your average football player. He’s a Stanford Graduate with a major in Communications. He graduated second in his high school class, and he’s a dedicated student of the game. He studies wide receivers, quarterbacks, passing routes, and formations unlike anyone else in the league. 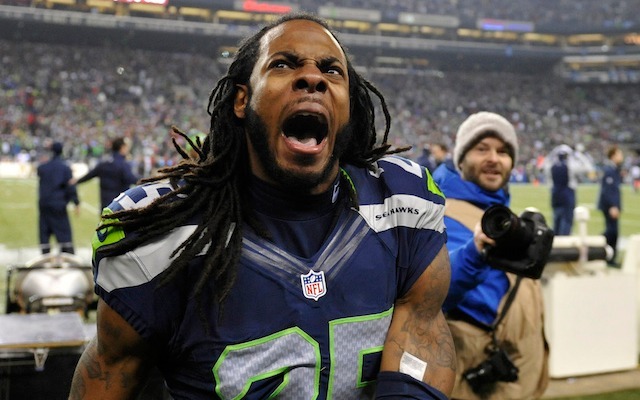 Although he is a big corner, Sherman doesn’t have world-class sprinter speed, running a 4.54 forty yard dash. However, he works hard to overcome this shortcoming and that work ethic has made him the best cornerback in the NFL right now. Sherman’s statements caused an uproar and many people labeled the Compton native as a thug. Even NFL Commissioner Roger Goodell commented on Sherman’s post-game remarks. “It’s an emotional game, and you see a young man who comes off the field and he’s pumped up, and there’s so much excitement in the stadium, but no, I’m not cheering for that,” Goodell said. People also started comparing Sherman to another all-star cornerback, Deion Sanders. Both players possess massive egos, unrivaled talent, and a penchant for being outspoken and controversial. Sanders once said that he had to talk more to get more attention, which would get him more money because he was not a quarterback. There was some truth in that statement during Sanders’ era. However, it doesn’t apply for Sherman. He is unquestionably the best in the game and will get a huge payday, with the Seahawks or another team. Unfortunately, his trash-talking distracts from his greatness. Bravado is necessary to compete in sports, but humility is necessary to be truly great. Players have to realize that the team is bigger than they are. Being humble doesn’t make you any less of a great player, it just allows fans the opportunity to compliment you rather than get overwhelmed listening to you talk about yourself. 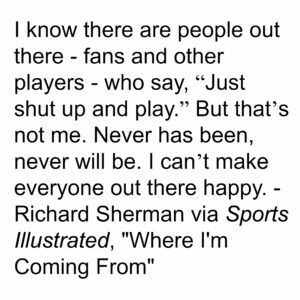 I would like to see Sherman give the fans an opportunity to appreciate his game, without interruption.